Gov. Roy Cooper speaks with Dr. Mary Claire O’Brien, professor of emergency medicine and senior associate dean for health care education; Dr. Julie Ann Freischlag, the chief executive officer of Wake Forest Baptist Medical Center; and Eric Tomlinson, president of the Innovation Quarter. Efforts are underway to bolster entrepreneurial activity in the Triad, which can be seen with the soon-to-be openings of Bailey Power Plant and the Winston Starts accelerator program in downtown Winston-Salem. And for the activity to continue, it’s important “to create the atmosphere where small businesses can start up and grow,” said Gov. Roy Cooper. “So we want to make sure that there is an educated workforce with the skills necessary,” he said on Tuesday. The Triad, he said, has all of these qualities. “So we’re working to attract businesses both large and small with our innovation economy and with this quality of life we want to encourage,” Cooper said. Cooper made the comments following a tour of the Wake Forest Innovation Quarter in Winston-Salem. The tour included Bailey Power Plant and Wake Forest School of Medicine. 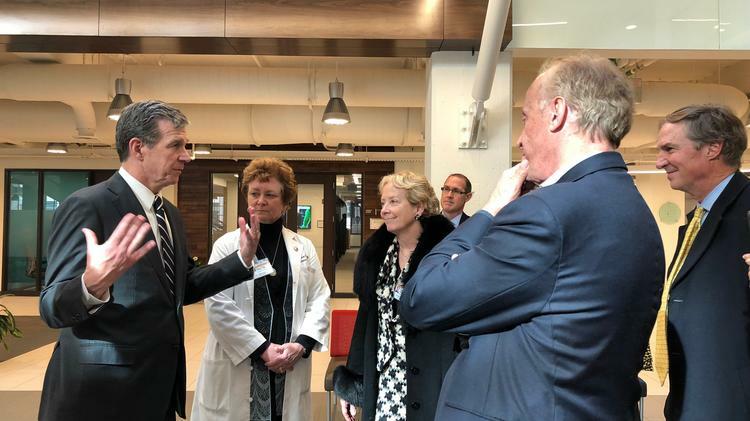 He toured the innovation hub with local business leaders, including Dr. Julie Ann Freischlag, CEO of Wake Forest Baptist Medical Center; Eric Tomlinson, president of the Innovation Quarter; and Inmar CEO David Mounts. Gov. 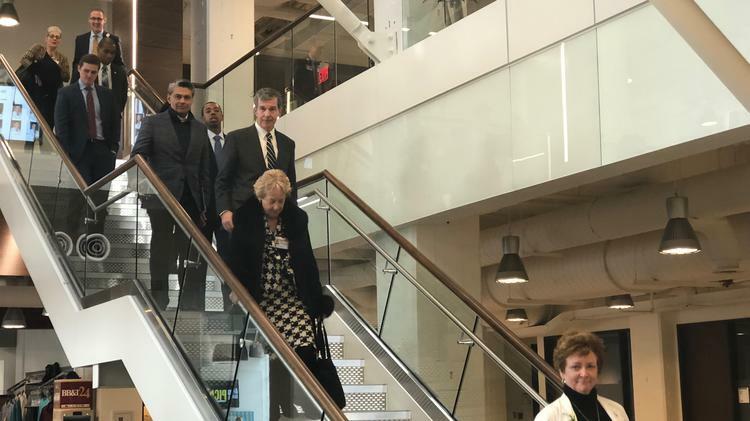 Roy Cooper toured Wake Forest Innovation Quarter in Winston-Salem. Also on the tour were Dr. Julie Ann Freischlag, CEO of Wake Forest Baptist Medical Center, and David Mounts, CEO of Inmar. “We wanted him to sense the entrepreneurial spirit here and the energy — not just with the companies but also with the institutions,” Tomlinson told the Triad Business Journal. The Innovation Quarter, with 150 companies, is full and starting to think about the next phase of development, he said. “We have great developers who want to work with us to help create this next phase, which will cost another $800 million and we’re in discussions with companies that might be anchor tenants for that phase of development,” Tomlinson said. One of the issues Freischlag brought up with the governor was rural health care. Providers in rural communities are facing a host of issues, including rising costs and declining reimbursement, leading organizations to form partnerships with one another. This was most recently seen with the former Morehead Memorial Hospital in Eden, which has joined the UNC Health Care system. “That touches every state but especially ours since there are so many people living in the rural environment,” Freischlag said.